As your new program chair, I would like to ask you, our chapter members, to share any program ideas that you would like the program committee to consider. We will be meeting soon over the summer to plan the year ahead and are interested in your input! Please join the programs forum on our new website to offer suggestions or feedback. Thank you! On May 23, 2016, members and guests gathered at Lagerquist Hall for installation of new officers and the annual student recital. Student organists (left to right) Charles Reinmuth, Brett Gaulke, Collin Ray, Amy Castle, and Pascal Weber. Member Jonathan Wohlers administered the AGO oath of office to the incoming members of the Tacoma AGO executive committee. Following the Guild Service, students of Tacoma AGO members played the annual student recital. Performers included Charles Reinmuth, Collin Ray, Amy Castle, Brett Gaulke, and Pascal Weber. Amy Castle studies organ with Jonathan Wohlers, and is a prior recipient of the Tacoma AGO organ scholarship. Paul Tegels teaches Charles Reinmuth, Collin Ray, and Brett Gaulke, and has also coached Pascal Weber. For the April meeting, AGO members and guests gathered at Christ Episcopal Church to hear a presentation by Carlton Monroe, DMA, concerning his use of Bach cantatas at St. Thomas Episcopal Church in Terrace Park, Ohio. 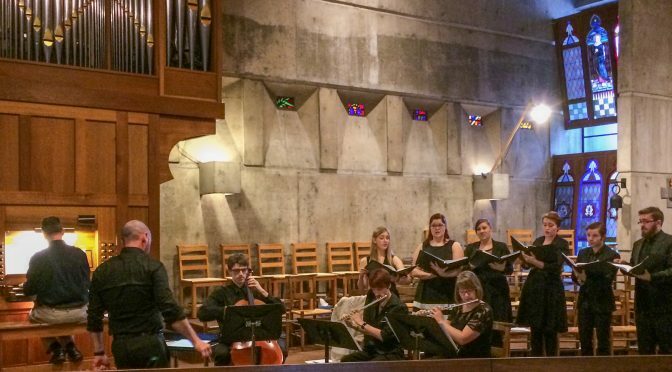 Musical examples were provided by musicians and singers from PLU, under the direction of Brian Galante and accompanied by Tacoma AGO chapter member Paul Tegels. Dr. Monroe discussed how he chooses cantatas, based not only on the liturgical season, but also on the practicality of difficulty of solo and choir parts and availability of instruments. His document with suggestions of cantatas, difficulty, season, instrumentation and vocal requirements is attached below. You can navigate the pages by placing your mouse over the attachment and using the navigation bar that will appear at the bottom. Tacoma AGO member David Dahl has published a new volume of organ music entitled “God of Grace and God of Glory,” named for the the first piece, a festive prelude on “Cwm Rhondda”. The Foreward includes some interesting background on the pieces, including comments about structure and performance. The volume is published by The Sacred Music Press, ISBN 978-0-7877-3478-7. The Tacoma AGO plans to offer a scholarship for the 2017-2018 academic year. At this time, there is a committee working to revise the guidelines and criteria. This page will be updated as soon as their work is done, sometime in the Fall of 2017.